WASHINGTON (CNN) - President Donald Trump on Monday insulted a small Virginia restaurant that recently asked White House press secretary Sarah Sanders to leave. The tweet serves to amplify a controversy that has been seized on by conservatives as an example of harassment of Trump officials by progressives. 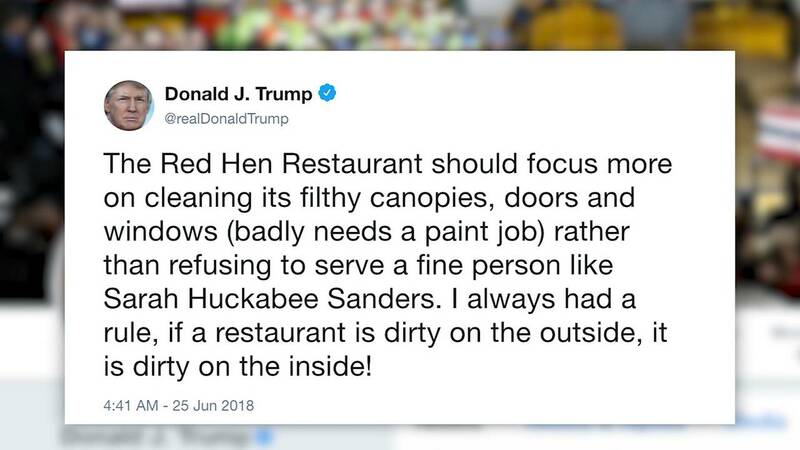 "The Red Hen Restaurant should focus more on cleaning its filthy canopies, doors and windows (badly needs a paint job) rather than refusing to serve a fine person like Sarah Huckabee Sanders. I always had a rule, if a restaurant is dirty on the outside, it is dirty on the inside!" Trump said. Sanders said on Saturday that she "politely left" when the owner of the restaurant told her to go because she works for Trump. The owner Stephanie Wilkinson told The Washington Post in an interview Saturday that she "would have done the same thing again." Wilkinson did not respond to CNN requests for comment over the weekend. Sanders began her press briefing Monday reading a statement reacting to the incident. "We are allowed to disagree but we should be able to do so freely and without fear of harm, and this goes for all people regardless of politics," she said. "Healthy debate on ideas and political philosophy is important, but the calls for harassment and push for any Trump supporter to avoid the public is unacceptable," Sanders added. A White House official says Trump asked Sanders to open her briefing today by highlighting the weekend incident. The President has made his views clear on this on Twitter and instructed Sanders to highlight it at briefing, official said. The incident came shortly after Homeland Security Secretary Kirstjen Nielsen left a Mexican restaurant in Washington after protesters confronted her there. The President's decision to call out the restaurant by name came hours after he tweeted an attack on Jimmy Fallon over a perceived slight by the "Tonight Show" host in a recent interview.